Well, this engagement chicken obviously doesn’t work. I’m still waiting for a man to show up at my door, introduce himself and propose. These false promises from Glamour are so heartbreaking. But at least the chicken was juicy and delicious. It was also so simple to put together as it literally takes a chicken, lemons and seasoning. It got well below 90 this past weekend so off I went to roast this chicken and make cornbread dressing. Again. I can’t help myself. I absolutely love cornbread dressing. Any. Time. At. All. Remove giblets from chicken and rinse in cold water. Let chicken drain then pat dry. Place chicken breast side down on rack in roasting pan. Pour lemon juice over entire chicken, including inside the cavity. Season with McCormick’s, salt and pepper. Take 2 lemons and prick holes in them using a fork. Place in the cavity. 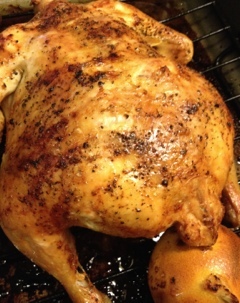 Place chicken in the oven and roast for 20 minutes. Flip chicken over so it is breast side up and cook additional 1 1/2 hours or until chicken reaches 180 degrees internal temperature. Let chicken rest then serve with juice from the pan. Garnish with fresh herbs and lemon slices, if desired.